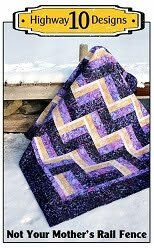 This is Yvonne’s Broken Herringbone quilt and the pattern is by Violet Craft. I love the selection of fabrics Yvonne chose, a nice mix of modern prints and tone on tone. Yvonne asked for the Tickle pantograph and I used white So Fine thread and Quilters Dream Blend batting. Another cool crisp morning here, –25’c but sunny with no wind so that I like. 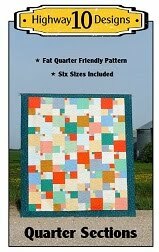 This is Yvonne’s City Slicker quilt and you can find the pattern here. She used a Cantik Batik Gemfive called Nunavut for the focus fabric and a grey Grunge for the background. She asked for swirly quilting and I chose the Allium pantograph for the quilting design. I also used medium beige So Fine thread and Quilters Dream Blend batting. The backing is an extra wide Stonehenge that matches the Nunavut bundle beautifully. Sorry the blog as been a bit quiet lately. My son came down with a bad flu last week then I caught it on the weekend. Then we received some very sad news this Tuesday, my grandmother who lived in a nursing home in Winnipeg also came down with the flu. She became so weakened by it that they sent her to the hospital where she passed away the next day with my mom by her side. She was 94 and a wonderful person, she will be greatly missed. As many of you know in Canada there was a horrific shooting at a Quebec City mosque last month where 6 people died and many injured. In response to this The Montreal Modern Quilt Guild is organizing a project called Quilts for Quebec and they are collecting House blocks to make into quilt to give to those families affected by this tragedy. You can read all about their project here on their blog. It is wonderful to read that quilters from all over Canada and the world are sending in block and our local guild members are making some as well. Here is my block, the pattern is one you’ll find in the links on the MMQG blog. If you are interested in making blocks to send, their address is in the link and they are requesting the block be received my March 4. I thought I would also share my new favorite T-shirt! I am a huge Game of Thrones fan so how could I not get it! If you are not familiar with GoT and original quote is from a character named Tyrion and he said “That’s what I do, I drink and I know things”. If you are wondering where I ordered it from you can find it here. I will warn you the ladies v-neck is sized small so order a size larger than you normally do. 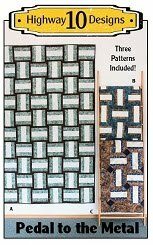 This is Lynn’s Norway Quilt and the pattern is by Thimble Blossoms. The blocks are a very large 26” square and the final quilt measures 78” square. The fabric is a Lucien line called L’s Modern Basics and the background is a white on white leaf print. Lynn asked for Bora Bora for the pantograph, Dream Puff batting and white So Fine thread. She brought a beautiful teal Cuddle backing so that with the Puff batting makes a very cuddly quilt! I think Norway looks right at home on a frozen Canadian lake! This is Evelyn’s Yellow Brick Road quilt and she used fun modern fabrics in shades of yellow and blue for her quilt. I chose the Tickle pantograph, used light yellow So Fine thread on top and white Bottom Line on the back. Batting is Quilters Dream Blend. It is suppose to warm up this week to above freezing temperatures so I hope my crystal clear ice survives the warm up. This is Vivian’s Snail Trail quilt and I love how she added the pieced inner border to the quilt! She wanted soft swirls quilted on it so Fascination was the perfect choice. I used a medium beige thread so it could be seen on the light background and on the burgundy blocks. She brought a Hobbs blend batting. 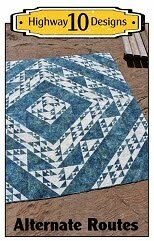 This is Cynthia’s Star Fling quilt and it is a free pattern by Atkinson Designs that you can find here. The great thing about this pattern is the star points do not go to the edge of the block so if you need to square up your blocks you won’t lose your points! Cynthia asked for swirly quilting so I picked Bora Bora for the panto, used light purple So Fine thread and Quilters Dream Blend batting. This is Cynthia’s Quarter Sections quilt and she used black and white prints with a mix of bright colours! I love this colour combination as it is so different from all the other Quarter Sections I have quilted. 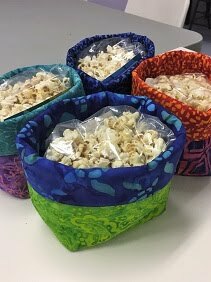 I love seeing how others pick fabrics for our Highway 10 Design patterns. Cynthia asked for a loopy pantograph so I picked Chantilly Lace. I used white So Fine thread and Quilters Dream Blend batting. This is Lori’s applique quilt and she asked for custom quilting with some feathers! 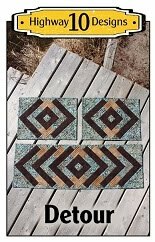 I can do that, feathers are my favourite design to quilt! Started with gradually increasing feathers in the large outer green border and SID around the applique border and then added curls to the background. I quilted feathers on the flowers and added veins to the leaves. The inner green border I did a feather curl design and then curls on the sashing. The blocks are SID with some CC’s and feather designs. I used four different colours of So Fine thread on top and used matching Bottom Line colours on the back. I prefer to match my thread colour when I do custom work but will use different colour threads top and bottom when doing edge to edge quilting. Quilters Dream Blend batting.